Become more independent in the use of energy by with intelligent technology from grace renewable energy!!!!! In order to be completely self-sustaining, and independent of a utility company, you need utilize a natural and environmentally-friendly source of power such as the sun. Our Off Grid Solar solutions are customized to suit your specific load requirements, and priority of operation. 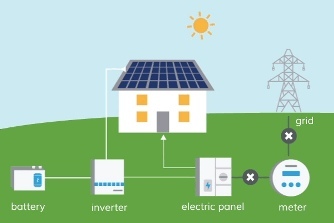 These solutions simply provide the best alternative source of energy to residential and such other small energy consumers where grid reliability is less and uninterrupted source of energy is required. To begin your energy independence today, and have confidence knowing that you are secure and prepared in case of a power outage, talk with grace renewable energy a professional manufacturer, supplier, exporter and installer of off grid solar system. You can rely on our support from planning to commissioning system.